Part 1: The rise and fall (and rise again) of the swamp monsters. Something happened in the swamps of North America in early 1971. What exactly the ‘something’ was is unclear, but it likely involved toxic waste, bio-restorative formulas, ancient magicks and possibly a touch of plagiarism. Whatever the cause, the effect was a veritable slime-beast population explosion. Most comic fans with an interest in things muskeg know that in May 1971 Marvel’s Savage Tales #1 introduced us to Man-Thing with an 11 page origin story, and that in July of the same year, DC’s anthology title House of Secrets #92 gave us Swamp Thing in the form of a cover and a standalone one-shot story. Those in the Marvel camp waste no time in pointing out that Man-Thing got there first; DC fans counter by pointing out that the Len Wein and Bernie Wrightson created Swamp Thing is well… better. What both camps tend to overlook, or simply ignore, is that in March 1971, a full two months before Man-Thing shambled out of the Florida Everglades, Psycho magazine #2 (published by Skywald) had given us cover art and an origin story for The Heap, a shambling bog creature that was all muck and pathos. Whether or not this sudden overcrowding in the swamps was simply coincidence or something a touch slimier is a question I’ll be coming back to later. First I’m going to muddy the already murky waters by stirring-in Air Fighters Comics #3, published by Hillman Periodicals in December 1942, because it’s there we find the first of the comic book muck men – The Heap. A different Heap. Skywald’s1971 Heap looked similar to his Hillman predecessor, in as much as one vegetation encrusted parody of humanity looks much like any other vegetation encrusted parody of humanity, but they had different origins and different modus operandi. Hillman’s creature was a mindless beast driven by primeval instinct, Skywald’s was an intelligent mind trapped in a monstrous body, his tortured humanity unable to be heard over the noise of all the screaming damsels in various states of distress. Theodore Sturgeon’s swamp creature story It! was first published in Unknown magazine in August 1940, but didn’t get the comic book treatment until Supernatural Thrillers #1 in 1972. As we’re already in 1942, let’s just pop back two more years to August 1940 and take a look at that month’s edition of Unknown magazine. There we find the first publication of the short story It! by Theodore Sturgeon. It! is the fertile ground to which the roots of all the muck monsters reach back; It! is the ground from which their seeds first germinated. Sturgeon’s story told of a beast that emerged from a swamp; a beast that is ultimately shown to be vegetation that had formed around the skeleton of a man and created new life. For those that have been paying attention that premise should sound familiar. 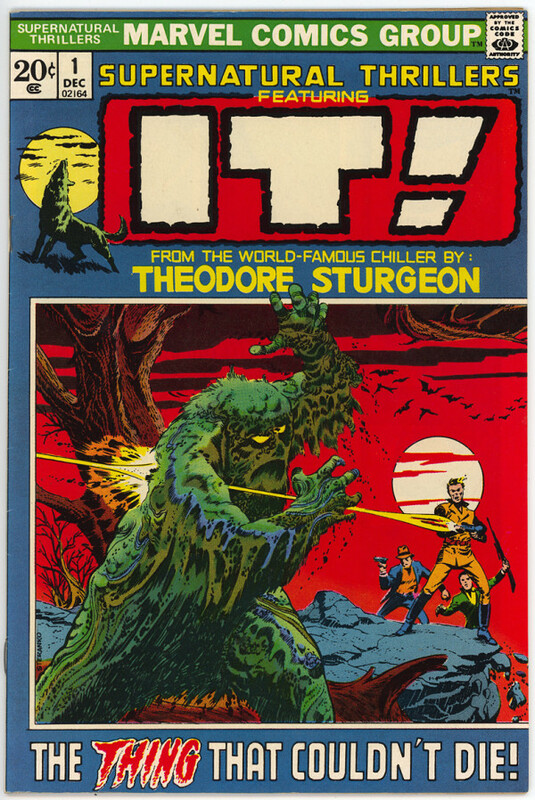 Sturgeon’s story eventually appeared in comic form in its own right in Marvel’s Supernatural Thrillers #1 in December 1972, reprinted in Masters Of Terror #1 in 1975. There’s little doubt that Sturgeon’s tale was the inspiration for Hillman’s Heap. The same can also be said of Solomon Grundy, who first appeared in DC’s All American Comics #61 in October 1944. Grundy was the reanimated corpse of a murder victim dumped in a swamp near Gotham City and was initially an adversary for the Golden Age Green Lantern, before becoming a thorn in the side of the Justice Society of America where, in one form or another, he has stubbornly remained ever since. Grundy’s origins mirror those of The Heap and the other swamp creatures, but he gets a mention here for completeness only as his basically human appearance (at least in the beginning) make him more classic zombie than true muck monster. Solomon Grundy aside, things went quiet in the swamps with the demise of Air Fighters Comics (retitled Airboy), and with it The Heap, in May 1953. Nothing of significance was to emerge again until the mass exodus of 1971. Which brings us back to the question of synchronicity. Is it likely that the appearance of three such similar characters in such a short space of time could be mere coincidence? The short answer is no, it couldn’t. Nor is it possible that one comic simply copied another because of the timescales involved with getting a comic from concept to finished article. It gets a bit tricky to navigate at this point as we negotiate the tangled undergrowth of half-truths, hearsay, conjecture and urban legend to find something resembling solid ground. Still, fortune favours the bold, so let’s wade on in. Skywald’s resurrection of The Heap, albeit in a new guise, was, according to Man-Thing’s co-creator Roy Thomas, his idea. Skywald was co-founded by Sol Brodsky after he left Marvel. During the early stages of Man-Thing’s development, Brodsky and Thomas had lunch and it was at this lunch that Thomas claims he told Brodsky about Marvel’s plans for Man-Thing and suggested that Skywald have a go at reviving The Heap. Stan Lee might have questioned the wisdom of that lunch, especially given that Skywald then beat Marvel to the punch by two months. With me so far? Good. Now try this. 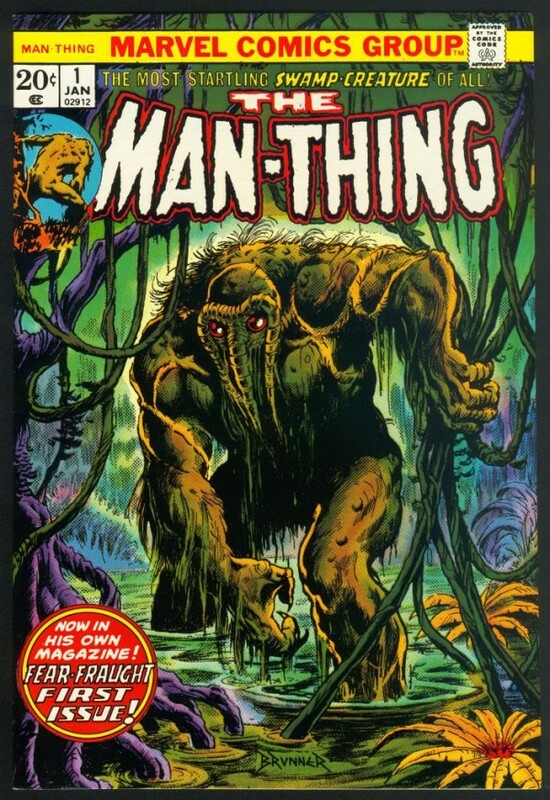 Man-Thing’s other co-creator was Gerry Conway, and Man-Thing’s second story, which was written in early 1971 but didn’t make it to print until June 1972 thanks to the demise of Savage Tales after a single issue, was the work of Conway’s roommate at the time. That roommate was none other than Swamp Thing’s co-creator, Len Wein. 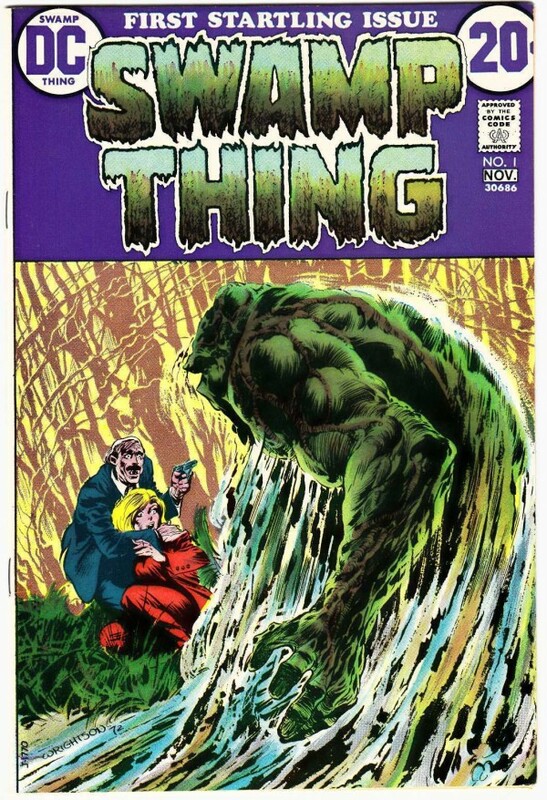 Swamp Thing had already debuted in House of Secrets #92 before Wein’s Man-Thing story saw the light of day in Astonishing Tales #12 in June 1972, but rumours of legal action by Marvel didn’t start until the publication of Swamp Thing #1 in October of that year. Swamp Thing’s origin story had been reworked since his House of Secrets appearance and Marvel now considered it to be too similar to the first act of Man-Thing. 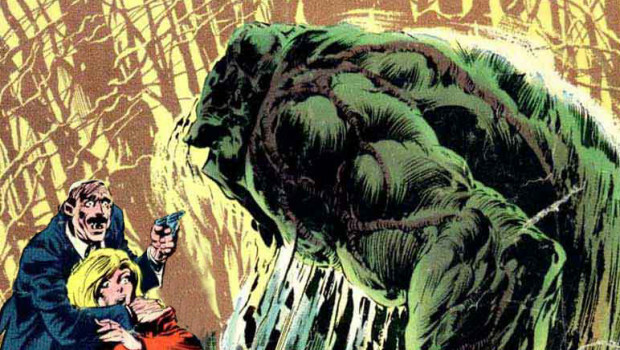 Conway has stated that he was aware that there might be a problem and had tried his best to talk Wein into changing Swamp Thing’s origin, but Wein had refused. Marvel never took DC to court over the issue, perhaps because Marvel were aware that it would also draw attention to the similarities of both companies’ creations to The Heap. After the origin stories the DC and Marvel characters followed rapidly diverging paths and the differences between them soon outweighed the similarities, with Skywald’s poor Heap being relegated to little more than a footnote in the ongoing Man-Thing .vs. Swamp Thing debate. More than forty years have passed since that particularly fertile few months in 1971, so perhaps it’s time to bury the rusty, moss covered hatchet and rejoice in the fact that it’s a big ‘ol swamp and there’s room enough for more than one muck monster out there. Coming in Part 2… Heap Big Trouble!